Landlords have a number of options at their disposal when it comes to marketing a vacant rental property. The goal is to generate a decent-sized pool of qualified applicants quickly and cheaply enough to fill a vacancy without placing financial strain on the landlord. A successful strategy will take into account the number of vacancies expected each year, the amount of rent charged, the location, and the overall appeal of the property. The simplest, easiest way to advertise an upcoming vacancy is the For Rent sign. In popular areas, this sign alone may be enough to attract the next tenant. It’s important that the sign is clean and looks new — weathered signs attract bad tenants. A phone number that the landlord can pick up immediately. Consider attaching a flier box and creating a print-out of this information that passersby can take with them. 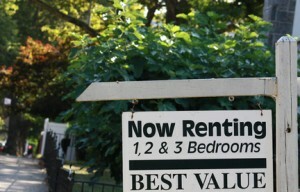 For Rent signs alone do not work well for properties with poor curb appeal, or in low-traffic areas. For Rent signs can create safety concerns. Vacant properties are at increased risk for vandalism with For Rent signs in front. Visit the property regularly and supply ample outdoor lighting. If the property is occupied, make sure prospective renters know to call, not go to the front door. Also, don’t allow property tours for prospective renters who come in off the street — meet prospects in a neutral location and verify their identity and qualifications before granting a tour. Landlords who have numerous vacancies throughout the year may do well with a permanent sign with the landlord’s name and phone number for interested prospects to call. Referrals from other tenants are a valuable resource for landlords. Chances are, the referral has already visited the property, so it’s an easier sell. It’s still important to screen referrals. Generating tenant referrals takes some forethought. First, landlords must strive to provide quality service in order to have satisfied tenants. Providing opportunities for tenants to bring friends over, like hosting an outdoor party in the common area, or offering tenant incentives for referrals, can increase the chances of finding the next tenant this way. Adjacent property owners are also good referral sources. Stuff a few fliers in area mailboxes. Free online classifieds are an attractive alternative to expensive newspaper ads, where landlords have to dice words and use abbreviations to save money. These online services make it easy to include photos, an important feature for renters, and offer landlords the flexibility of pulling the ad quickly after the vacancy is filled to avoid fielding unnecessary phone calls. One downside of these free services is the need to repost the ad routinely. However, the ad will receive extensive exposure, and normally will run only for a few days. Taking the time to construct an effective ad helps generate more interest. To cut down on scams, it’s advisable to watermark photos so they can’t be as easily pirated. Generally, it’s best not to list the actual property address on the Internet. While Craigslist enjoys a top spot on every landlord’s advertising list, other services that cater solely to rental listings can offer higher conversion rates — and that means better results with less time spent prequalifying applicants. Ads don’t have to be renewed daily, and these services often provide the best formatting tools. Another advantage is the exposure the ad will receive based on the extensive traffic the service generates. However, there is a fee for the service. Landlords who need to fill many vacancies throughout the year, or who manage multifamily properties may be best-served by using one of these more targeted services. It’s easy and inexpensive these days to set up a website for advertising rental properties. That way the properties can be listed exactly the way the landlord wishes and it’s easy to update the information. The website can include a number of pages that highlight the landlord’s experience or policies, and can include blogs or other helpful widgets that bring viewers to the listings. The trouble with an independent website, though, it getting the needed exposure in search engines. That process may require professional assistance, and can take many months to achieve. This method is best for landlords who wish to give out the link to individual prospects — like on a flier or via email. It is also valuable to a landlord with multiple properties who intends to keep the site active for many months or years. Networking involves marketing through business channels including social media like Linked In in order to find potential referrals when the time comes to fill vacancies. It takes a significant amount of time to develop and maintain a network, but there are other benefits to building such an association. For instance, it may be helpful to share ideas with others, and it may be useful for finding other rental property investment opportunities. I have found that the local newspaper works best for me. It does cost some money but the people who read the local paper are the types of people I am looking for as tenants. They are generally older or middle aged and do not go naturally to online sites. The paper has a website where the ads are displayed as well and where I can post a picture. I do not have to redo my ad every two or three days to keep it current as I have to do on the larger websites.